If you want to know how much money the city of Chicago spends on holiday parade security in a given year, you can file an open records request with the city for the details. If you want to know how a college president spends his or her time, you can ask for his or her official calendar through the Freedom of Information Act (FOIA). FOIA allows anyone to request information from the government. 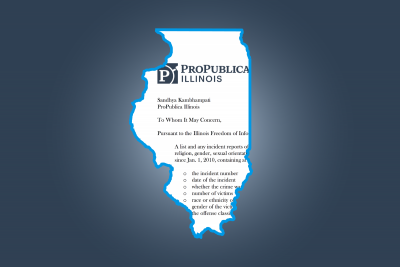 In my first six months at ProPublica Illinois, I’ve sent over 1,018 requests for information, to everyone from the Department of Transportation to the state lottery. As a data reporter, I need to understand what information government bodies across the state keep, how they keep those records and what they don’t retain in documents or databases. To do that, I need to know different state and local agencies, and maintain a list of contacts throughout the state. Finding your way through some of the records systems is like walking in the dark — and getting information can take a lot of time. While I’ve sent requests all over the country, I’ve learned Illinois has its own quirks. Here are a few things I’ve learned about FOIA in Illinois that might help you get the information you want. Tip 1: Do your research and know the law. Be patient and diligent about follow-ups. Filing records requests takes time, persistence and putting a bit of pressure on officials to have them produce information on time. Illinois law requires agencies to respond to requests within five business days, so typically I give them a call if I don’t hear back when the deadline passes. With every request, I think about how agencies might respond and where they might raise objections. Here’s a sample denial letter, as well as a sample grant of request, I like to reference. Compared to other places where I've filed FOIAs, agencies in Illinois seem more likely to immediately ask for an extension and they often cite the same reason. Then there are agencies that try to scare you away by suggesting that fulfilling a request will take a ridiculously long time. Unfortunately, this tactic is not unique to Illinois. In this case, the agency initially claimed it would take 542 days to comply with my request. Once I explained how they could more easily do the work, 542 days turned into three. Sending out these requests also requires me to know the exemptions to the law that allow agencies to withhold information from a request. For example, I know I can’t get law enforcement records that interfere with an open case; business trade secrets or personal information (social security numbers, for instance) that could identify a person. Other exemptions include information that, if disclosed, could compromise national security or endanger someone’s life or physical safety. If you believe a request has been wrongly denied, you should be prepared to appeal. Anyone can request review from the Illinois Attorney General’s Public Access Counselor (PAC), which helps to resolve open records requests, within 60 days of a denial of a request. I find that it also helps to keep diligent notes about your dealings with employees and any correspondence with the agency. If I didn’t have a system for tracking my records requests, I would run the risk of letting them slip. So I keep a spreadsheet that includes notes on each request, which FOIA officer is handling it and the date of the initial response. The state requires every agency to display and make a directory available designating who its FOIA officers are on its website and how requests should be sent (electronically or through mail). I’ve had to think about alternative ways of finding records officers, especially in smaller towns where there are often just four or five municipal employees, and there’s no official website. Sometimes, the only way I can get a phone number or a name of the FOIA officer is to do some deep diving on social media or in newspaper clippings. Here’s a list of some FOIA officers in Illinois. And perhaps the most important point about knowing how to make a request: If the records are available on the agency’s website, don’t ask for them. It’s only going to show them you’re not doing your research. Tip 2: Many agencies still keep their records on paper. That means requesting them is not always easy. Some agencies only allow inspection of documents in person because the time it will take them to scan the documents is “too burdensome,” a common exemption used in FOIA. Others might tell you that since they have the data in paper records, they can’t answer a specific question about the data for you in a timely manner. For example, an agency might have to hand-enter staffing data from paper records just to be able to provide you with the total number of employees in a certain department. Some agencies send documents only on floppy disks, CDs or flash drives. Others send a large manila envelope of documents complete with a rubber band bow for you to hand enter or scan into electronic format. As a data reporter, roughly 80 percent of my job is cleaning and wrangling data from inconvenient formats (like paper) into databases. When agencies send Excel spreadsheets printed and scanned in with hand-written notes, I have to spend time extracting the data using special software or hand-entering the data. So even though an agency is complying with the law and giving us the information we have asked for, it’s a given that we’ll have to do more work to even use the information and deduce any sort of finding. Tip 3: Remember, there’s a human being behind every record and document. So play nice. Some FOIA officers try to discourage people, especially reporters like me who pester them for records. And sometimes, you even see their complaints about your requests. I try to remember that there are countless other people asking for records and the agency I’m dealing with might be juggling many other requests. I like to get to know FOIA officers, understand what irritates them, how they prefer I communicate — via email or phone — and what times are most convenient to reach them. I save all this information in a spreadsheet. Because I send so many FOIA requests, I need a game plan for tackling each department. If I make consecutive requests to the same department several days in a row, I could tick off some employees. So I keep a log of all the information I’d like to request, call the FOIA officer to see what they have on their plate, and begin negotiating. For example, for our Documenting Hate project, I’ve sent requests to police departments all over the state and asked for several years of hate crime data. Rather than ask for all 10 years of data at once, I work out a schedule that is convenient for me as well as the records departments, especially in small jurisdictions. I also follow up on my requests at the same time and same day every week, so the FOIA officer knows I’m diligent. It also puts a bit of pressure on them, I think. Illinois FOIA officers seem to appreciate the reminders, though I can imagine some find my badgering them for records annoying. In my experience, Illinois FOIA officers have generally been helpful in leading me to other agencies that may have records I’m seeking if their agencies don’t have them. Show that you value their time, and sometimes they’ll come through for you. Perhaps the best tactic is to actually go the agency, meet records officers and ask them to show you how they do their work. It’s easier to understand the process when you find out the agency keeps its documents in a closet or a musty old basement filled with boxes of files. One agency I visited had lost data because a pipe burst in the records closet. Their workers were forced to enter handwritten notes and tally up information from water-damaged paper records. These visits also let you see the programs and software an agency uses, which is especially useful when they tell you they can’t export your records because they use some obscure government computer program. Also you’ll see if they do, in fact, get 15 calls a day for records and have to go through various hoops to find the data, wrangle it and redact it. The time you’ll spend on these visits is worth it when you get information that had been sitting on a bunch of floppy disks, just begging for someone to analyze and report on it. Tip 4: Always FOIA the FOIA requests and know how they keep their data. You’re probably wondering what have I asked for in my thousand-plus records requests? Well, out of all my requests, I’ve received 803, or 79 percent of them. Some of them were FOIAs on the FOIAs — so asking for what other people have asked for. If you know what records have already been granted, you can request the same records and not have to wait months for your data. So ask for the agency’s FOIA logs. I’ve also asked for the record retention schedules for state agencies, which help me understand how and where the agencies keep their records and how often they shred them. The record retention schedules are an index, with codes for each department and each kind of document the agency keeps. When I get them, I add their shredding calendars to a master calendar. That allows me to know when they are going to purge their records, so I can request them before they disappear. I’ve also digitized these schedules, so our reporters can search them. This is helpful when we’re requesting documents; the more specific we can be, the faster and easier it will be to get what we need. These skills have helped me navigate the systems of Illinois, but I know there’s much more to learn. My hope is that with each FOIA request, I can shine a light on information we can use to tell a larger story and encourage government to be more transparent. I’ll be tracking my FOIA requests at #PPILFOIA on Twitter. That's where you can find my current tally of fulfilled, late and newly requested documents. If you have a tip or recommendation of what I should FOIA, tweet me @sandhya__k or email me [email protected]. Sandhya Kambhampati is a former data reporter at ProPublica Illinois, where she used statistics and databases to uncover structural issues and abuses.